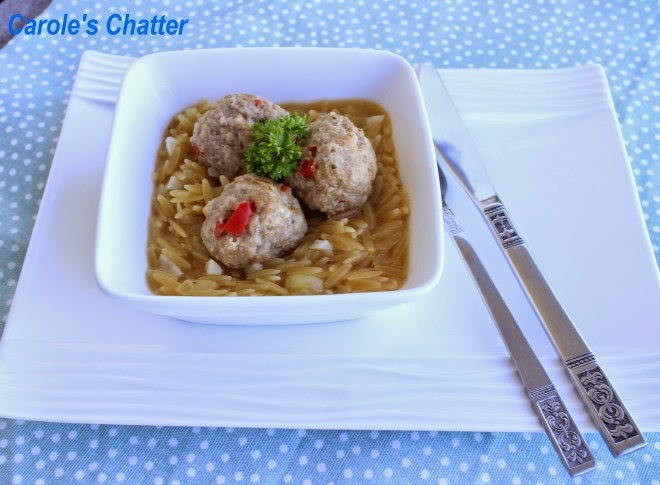 Carole's Chatter: Pork Polpette with Pasta – the 3 P's! Pork Polpette with Pasta – the 3 P's! Pork Polpette with Pasta was a dish that worked out pretty well. I made some plum sized pork balls and then cooked them in chicken stock. After they were finished I re-used the chicken stock to cook orzo style pasta. Mix all that together – but don't over-work it. Roll it into plum sized balls with wet hands and pop into the fridge for an hour or 2. If I want to try and have even sized balls I use a measuring spoon or ice cream scoop to make each one the same. When you are ready to cook, pop the polpette into just boiling chicken stock for 10-15 minutes. Do them in batches rather than all at once. The first batches will need less time because they'll continue to cook a little when there are sitting wrapped in foil. For the pasta, first fry up some chopped onion and garlic in a mix of butter and olive oil. Add your pasta (I used a small rice like one). Fry for a couple of minutes, add a touch of limoncello (or white wine) to deglaze the pan and then add your still hot chicken stock gradually at first. Serve when the rice is tender (about 15 minutes). Not diet food but delicious! You come up with such good recipes!! Minced pork.....I wonder if that would be like sausage here. Not sure I have ever seen minced pork in the grocery stores. I'll bet the orzo has a ton of flavor cooked that way. I love orzo, so I'm happy to see it featured twice this week! I didn't know you could keep fresh ginger in the freezer! Great idea! This meal sounds and looks very tasty! I always keep my extra ginger in the freezer-it is such a good tip. I like the flavor of orzo.